Obama is just soooo relatable… He’s just like you and me. Right. It’s funny… I don’t ever recall either of the Bush presidencies living it up like this – ever. They had their private ranches and Camp David. Reagan never, ever did this either. In fact, I don’t think Clinton ever did this – not to this extent. This is just flaunting it in America’s besieged face. Spending millions to traipse across the globe, partying it up and retreating to $12 million dollar estates; spending millions to rent it, plus security and perks. It’s obscene when so many in this country can’t find work or even know where their next meal is coming from. The Democratic Communist Party here in the US portrays themselves as the People’s Party – what a monstrous joke. The Boston Herald reports that President Barack Obama, first lady Michelle and daughters Sasha and Malia will be staying on Martha’s Vineyard from August 8-23. The Obamas have spent almost every single summer on the tony island off the coast of Massachusetts’ Cape Cod except for 2012 – when the president was running for re-election. 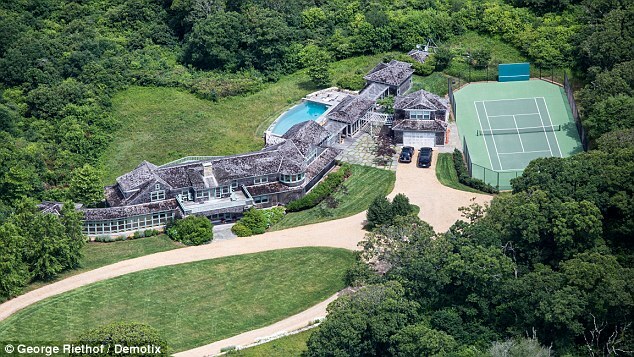 Continuing yet another tradition of their annual retreat, the Obamas are also expected to stay at the same $12million ‘cottage’ in Chilmark they rented last year. The 8,100-square-foot home features seven bedrooms, nine bathrooms, a basketball/tennis court, hot tub, infinity pool and views of the Elizabeth Islands. The home is owned by wealthy widow Joanna Hubschman, whose husband Henry died of cancer in 2011. Four years before his death, Mr Hubschman, a General Electric executive, contributed $6,900 – the maximum donation then allowed – to Hillary Clinton’s 2008 bid for president, according to the Center for Responsive Politics. However, it was Barack Obama who took the party’s ticket and went on to win the White House. Two weeks before the general election, Mr Hubschman contributed $2,300 to Obama’s campaign. This year’s vacation is likely to be a bit more relaxing for Mr Obama, who faced a wave of criticism for his golf playing last year in the midst of a crisis with ISIS. In the middle of Mr Obama’s vacation last year, the terrorist group released the first of several videos showing the decapitation of a Western citizen. 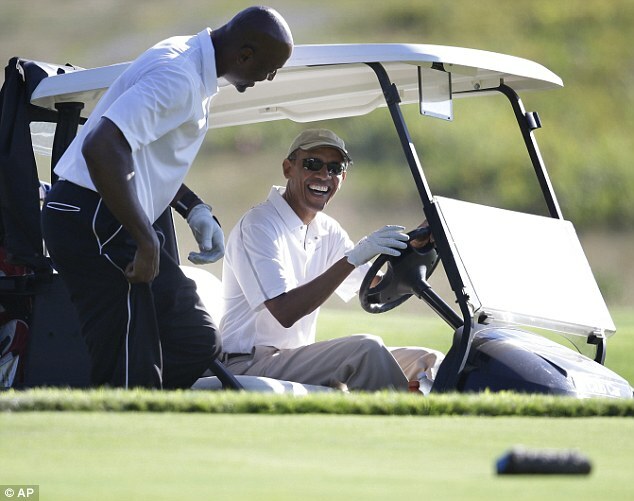 While Mr Obama was forced to return to Washington at least once during the trip, he did return to the island where he was pictured laughing with friends on the golf course as the nation mourned for fallen photojournalist James Foley. A round of golf on the island ranges in $170 at the Farm Neck course to just $35 dollars at MIni Meadows. In addition to golf, the Obamas usually spend their vacations out and about on the island, going for bike rides in Manuel F Correllus State Forest and spending days at the beach. But it appears the Obama girls like a bit of pampering as well. The Herald reports that the Obamas have a manicurist booked to visit them three times a week during their vacation. The Obamas have also been known to haunt local eateries like State Road in West Tisbury, The Sweet Life Cafe in Oak Bluffs and Beach Plum Inn in Menemsha. They also spend time with longtime Obama aid Valerie Jarrett and her family. And right there with the Obamas will be Valerie Jarrett and family. This is America’s royalty – corrupt, Marxist, thuggish criminals that we allow to rule over us and wallow in wealth and privilege while they beat us to death. Obama’s ISIS emergency isn’t over. It’s ongoing with the genocide of Christians throughout the Middle East. But what does he care? He’s nationalizing our police and stripping us of our freedom of religion and speech – all in the name of ‘change.’ Dictatorial change – communist change. He says he has a lot left to do before leaving office and inbetween golf matches. And what do throngs of Americans do? They line up for the uber Marxist buffet of Hillary Clinton and Bernie Sanders, with their hands out in Greek entitlement fashion. Or they fool themselves into following RINOs who want virtually the same thing the Marxists across the aisle want. This is what America has empowered and bought into. God help us.